Add the onion, garlic and ginger in a blender and make a rough paste (not to fine). Heat the oil and add the Fenugeek and Mustard seeds. When it starts to splutter, add the slit green chillies and stir fry for 5-10 seconds. Add the onion-ginger-garlic paste and fry for about 3-5 mins till the onion changes color and become light brown. Then add the chopped tomatoes, curry leaves, chilli powder, turmeric, salt and coriander powder and cook till the tomatoes become soft and mushy. Add the tamarind paste and 1 1/2 cups of water and bring it to a boil. Add the fish pieces and cook for 8-10 mins. Do not stir the fish pieces as they make break. Gently hold the side of the pan and move the pan in slow circles twice,so that the fish mixes well with the curry. Lastly , add the coconut milk and simmer for another 5-7 mins. Adjust the seasonings as per your taste. 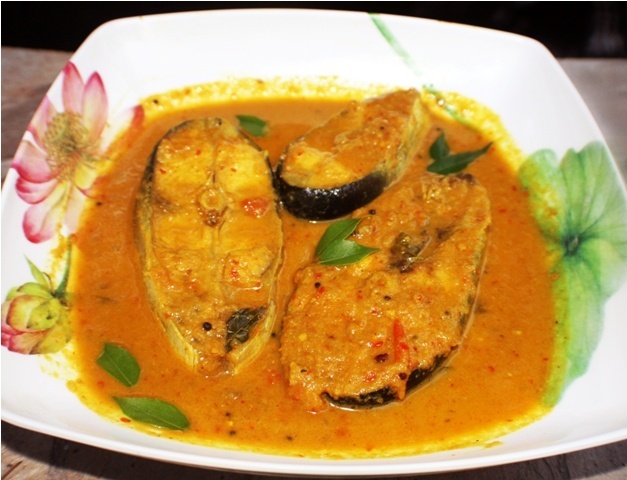 This entry was posted in Fish and tagged Fish curry with coconut milk by Kamakshi. Bookmark the permalink.